Welcome! Enjoy quality, spiritual stress management links I've carefully chosen for you. With gratitude, these are sacred spaces which have inspired me throughout the years on my mindful meditation journey around a psychic circle or heroic full-circle to Oneness. So you're invited to Follow Your Bliss. Interested in exchanging links? Please send an e-mail with a link to your site so I may review it. Text links are the only format accepted at this time. Please limit the text links you provide to four lines or less of copy. Thank you. Best with Blessings. This is a family friendly site...always and all ways. CLICK PHOTO for Padmasambhava Buddhist Center Spiritual Heart-Friends and Mentors, Dzogchen meditation masters of The Nyingma Lineage: His Eminence, The Ven. Khenchen Palden Sherab Rinpoche (left), his brother, Ven. Khenpo Tsewang Dongyal Rinpoche (right with 'Tsamo') and their beloved father, Ven. 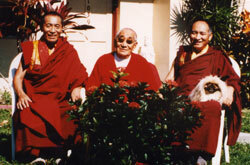 Lama Chimed Namgyal Rinpoche (center) who made his (parinirvana) transition in the 1990s. Sadly, my beloved teacher and spiritual father, Khenchen Palden has passed as well into parinirvana in June 2010. May they both return swiftly for the sake of all sentient beings! Spiritual Stress Management Links: An incredible, colorful site chock-full of enriching information: Tibetan Buddhist chants, mindful meditation, healing prayers and beauty. Follow your bliss with conscious breathing. 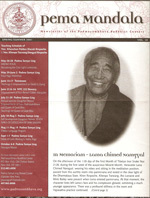 Once you're there… click on Pema Mandala Tab (for free back-issues) of a magazine I co-founded/edited for six years at the Rinpoches' urging. It's brimming with excellent articles on Tibetan Buddhism, mindful meditation, etc. Browse and you'll understand the nature of my life-work: "Doing a 360" a spiritual, Oneness mandala. This is the online home of the greatest mythologist of our time. I met the esteemed professor when I was a teen. During a private conversation after his workshop entitled, Mythological Symbols and the Psyche, he said to me his now famous words: "Follow your bliss." Campbell's classic circular monomyth of The Hero's Journey inspired my first published book, Doing a 360: Turning Your Life Around to Follow Soul's Purpose, a creative, life-changing matrix. He said: "You have to go full-circle in life; if you have resistance to your past ... you haven't finished the journey." This organization is the steward of integrity and diversity in Yoga. It provides a national registry for instructors. Those who meet their standards legally may use an RYT or E-RYT (experienced) after their name. In the Spring of 1999 YA was formed as a not-for-profit 501-C-3 entity. 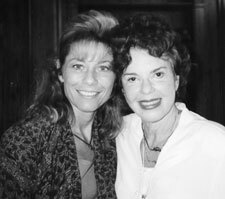 I was one of the first group back in 2000 to become a registered yoga teacher. Today, many thousands have raised the bar of excellence. Copyright 2007 - 2020 and Beyond... All Rights Reserved.